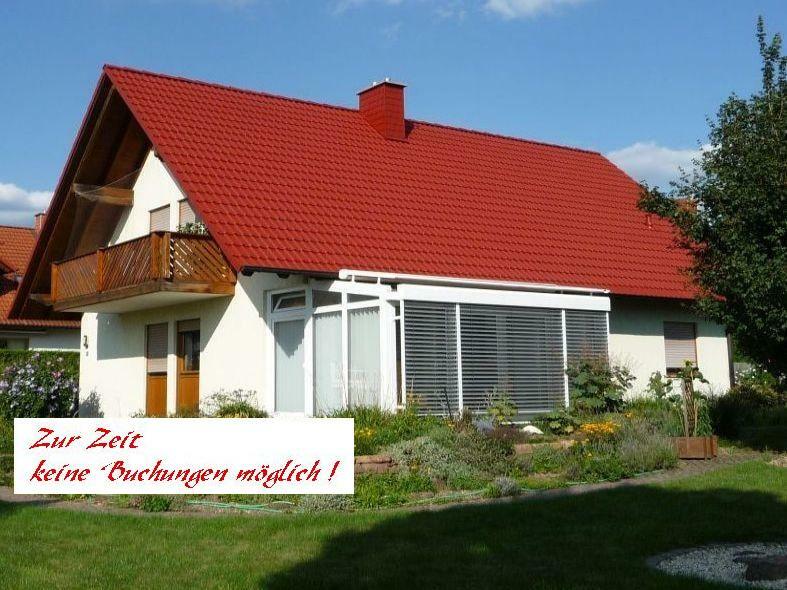 You would like to spend your holiday or just some days in the tourism region Churfranken and therefore you are looking for a vacation apartment. 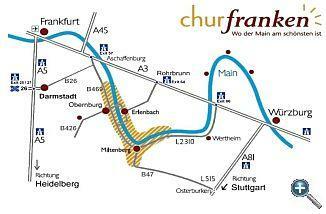 Churfranken means the area between the natural preserves "Spessart" and "Odenwald" at the river "Main" – where the "Main" is the most beautiful – (Bayerischer Untermain). Further possibilities are tours to Lower Franconia (about 80 kms to Würzburg) or the Rhine-Main area (about 60 kms to Frankfurt and 56 kms to Darmstadt). On our web pages you find out everything about our vacation apartment and about numerous possibilities for recreational activities. The apartment (rooms height 2.5 m) with a »separate entrance« is located in the basement, but benefits on »natural light«. It consists of a 25 sqm room, a little kitchen and a bathroom with shower, washbasin and WC. » Dining corner, 2 electric hotplates, refrigerator, coffee maker, toaster, etc. Because the apartment-entrance is via an outside staircase with 13 steps, the apartment is not suitable for persons which are handicapped to walk or visual-handicapped! Photos of the apartment see menu-link - "Gallery"
♦ The final price (including running costs) plus 10 Euro costs for final cleaning »must be paid cash on the spot to get the room-keys«. ♦ For a booking ahead of time, it is necessary to make a down payment of 40 % of the final price! ♦ If you cancel the confirmed booking or if you do not arrive, the owner keeps as loss of rent the 40 % of the final price. ♦ This case does not take effect if the client until 48 hours before arrival cancels his visit for important reasons, such as death, accident or other unforeseen event and proves this fact by a document. ♦ As security for the keys must be deposited 20 Euros. The repayment takes place when you give back the keys. Where is Erlenbach a.Main located? Erlenbach am Main (Administrative district Miltenberg, Administrative region Lower Franconia, Free State of Bavaria, Germany) lies between Aschaffenburg and Miltenberg in the valley of the river "Main" (because of his shape it is named "Main-quadrangle"). The distance to Frankfurt Airport is about 60 kms. The tourism-region »Spessart-Odenwald-Main« is ideal for hikers and for cyclists. So, as example, the »Main-valley cycling route« leads from Bamberg to Mainz along the river "Main" thru many medieval towns (e.g. Wertheim, Freudenberg, Miltenberg, Klingenberg, Obernburg, Aschaffenburg) and also thru Erlenbach. The vineyards along the river "Main", on the steep sandstone-hillsides, can be hiked on the »Franconian red-wine hiking trail« (by 6 stages of around 70 kms or by 5 stages of around 55 kms). The excellent wines which grow here, can be tasted in places, named »Häcker-Wirtschaften« in Erlenbach as well as in those of the neighboring communities. (Häcker-Wirtschaften are »on certain days opened private-rooms« of winemakers and wine growers, in which they sell directly, their self-produced wines). Possible only in written form - via online form, by email or by letter.